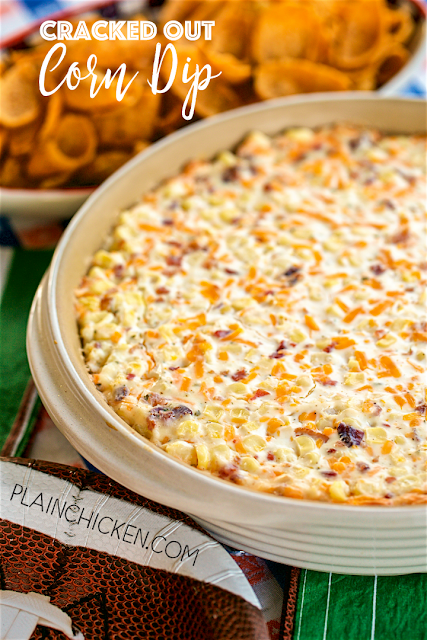 Cracked Out Corn Dip - OMG! SO good! Corn, cream cheese, sour cream, cheddar, bacon and Ranch. I took this to a party and it was the first thing to go! Can make ahead and refrigerate until ready to eat. 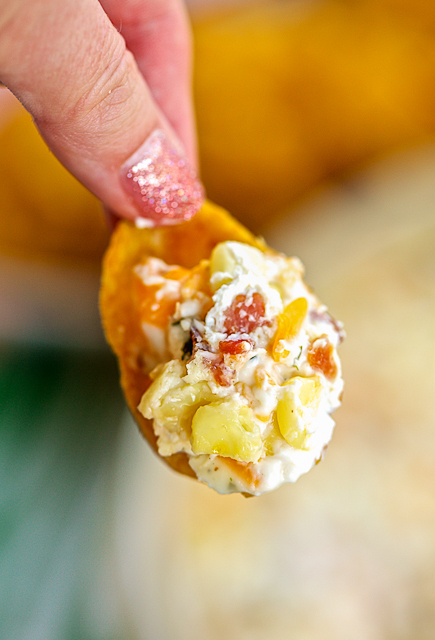 Our FAVORITE dip! YUM! We have another big weekend of NFL playoff games this weekend. Chicken Legs and I will be parked in our den watching them all and eating this awesome Cracked Out Corn Dip. Corn, sour cream, cream cheese, cheddar, bacon and ranch. OMG! SO good! We could not stop eating this dip! It just kept calling my name. I ate way too much of this! This dip can be made ahead of time and refrigerated until you are ready to bake and eat it. I used frozen Silver Queen Corn in the dip because it is my favorite. If you don't have Silver Queen Corn or don't like it, just use regular yellow corn kernels. Either way it will taste great. We served this with some Fritos. It was a winner! Is this better warm or cold? I think it's wonderful warm and cold! My sister made this for New Year's Day and I didn't even use chips to eat it... yep, just used a fork. And that's how I've been eating the leftovers. Seriously, this is like crack! No joke in adding that to the title. SO glad it was a hit!! It is seriously addicting! Making it again for the Super Bowl! Can you freeze after using? How long is it good refrigerated after making? Thanks! I've never frozen the leftovers of this dip. I've made it a couple of days in advance of baking and it is fine. Thoughts on subbing artichoke hearts for the bacon? Do I need to thaw frozen corn if I am going to prepare and bake it the next day? Thanks so much for the quick response - preparing it now for tomorrow night! I made it on the stove top and transferred to a crock pot to take to a party! It’s fantastic!!! I also added some chopped jalapeños! I have fresh corn. Would that change amt. Of ingredients? what else can u use for dippers? I don't have sour cream can i add a jar of store bought ranch dip instead?